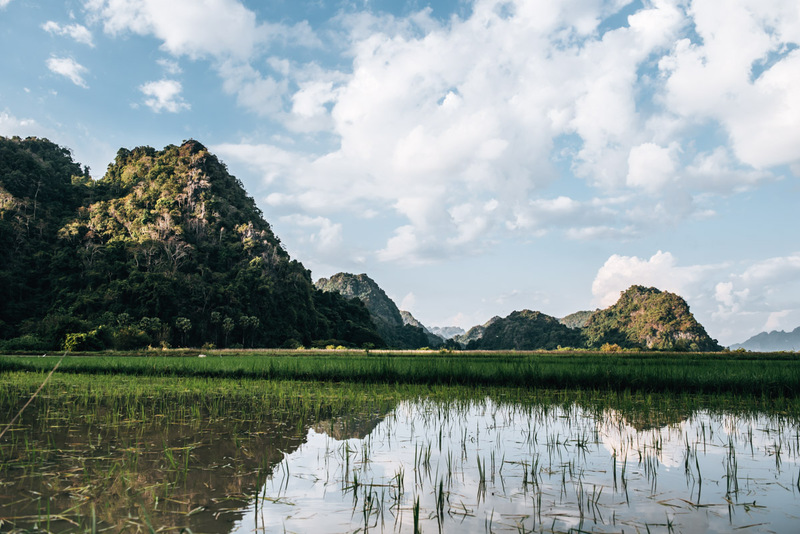 The idyllic Hpa-an and its lush green landscapes were one of our highlights during our trip through Myanmar. We had fallen in love with the beautiful landscape of green limestone cliffs before our first bus had even arrived. In that moment, we had no idea that the view from Mount Zwegabin would top even that. 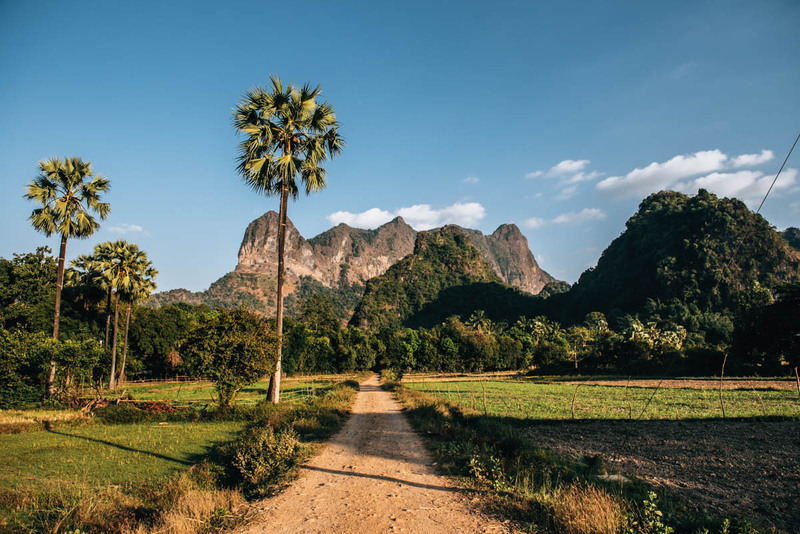 In this blog article, we’ll share with you which sights and experiences you absolutely should not miss in Hpa-an in Myanmar. 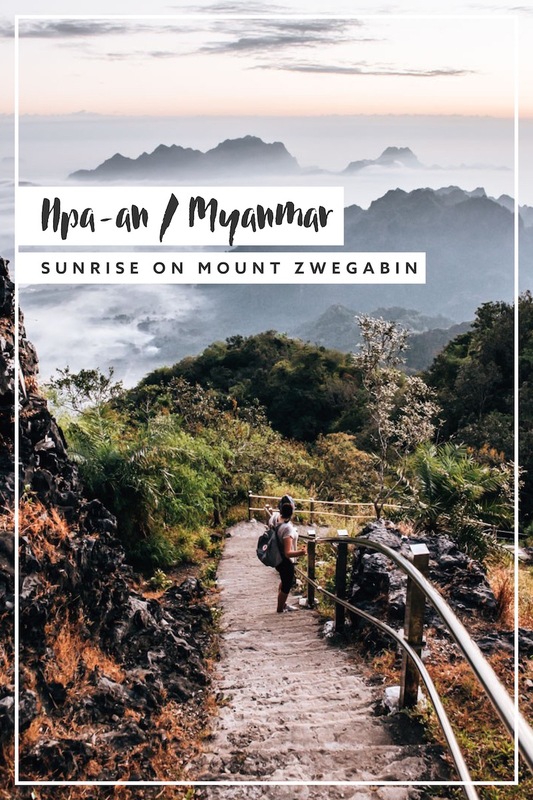 First and foremost is the climb up Mount Zwegabin, which is one of our sweatiest, but also one of the most impressive experiences in Myanmar. Hpa-an is about six hours by bus east of Yangon and is the exact opposite of your big city chaos. 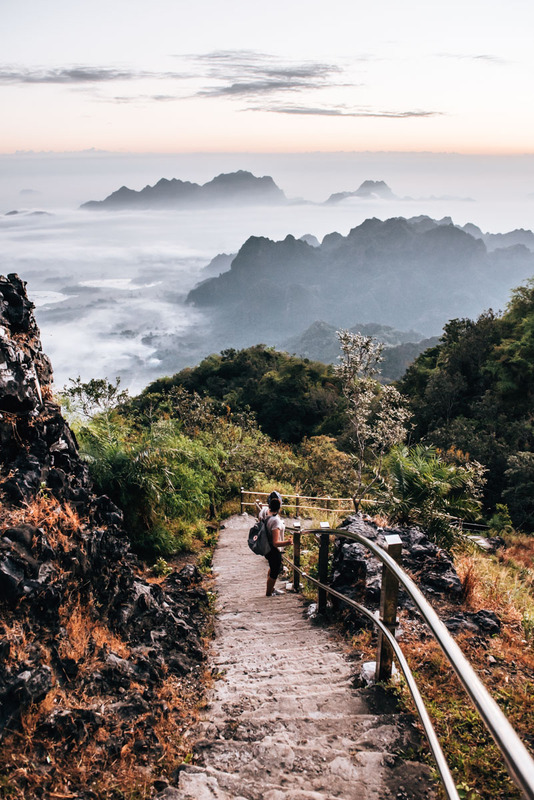 Sure, in the centre of a city with 50,000 inhabitants, there’s a fair amount of hustle and bustle, but the rest of the Hpa-an, especially the surrounding areas, is pure bliss. 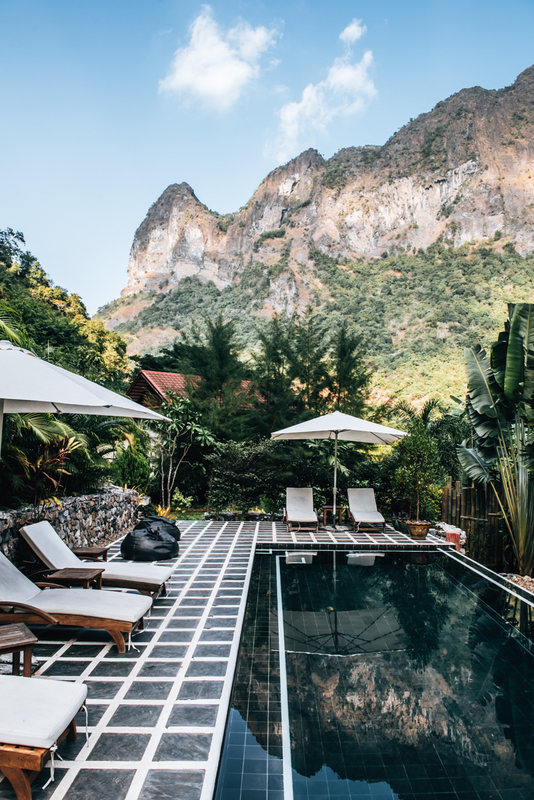 Nestled between the Thanlwin River and the limestone cliffs, Hpa-an is certainly one of Myanmar’s most scenic destinations. 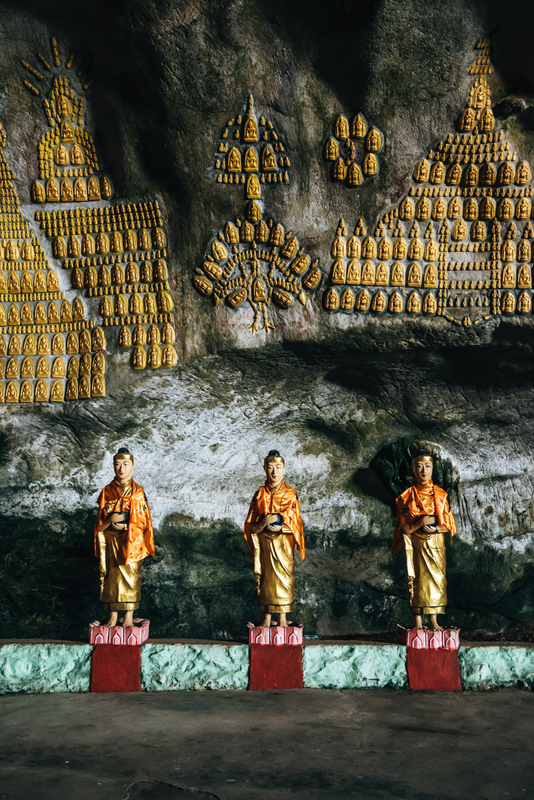 Most visitors are drawn to the impressive limestone caves, which are in abundance here in Hpa-an. Another frequently visited site is the Kyauk Ka Lat Pagoda. There, in the middle of a small lake, perched upon the summit of a steep, green-clad rock – a pagoda, poised up into the skies. (A pagoda is a is a multi-layered Hindu or Buddhist temple most commonly found in India or South East Asia). The Kyauk Ka Lat Pagoda is deserving of being one of Hpa-ans’ most photographed landmarks. 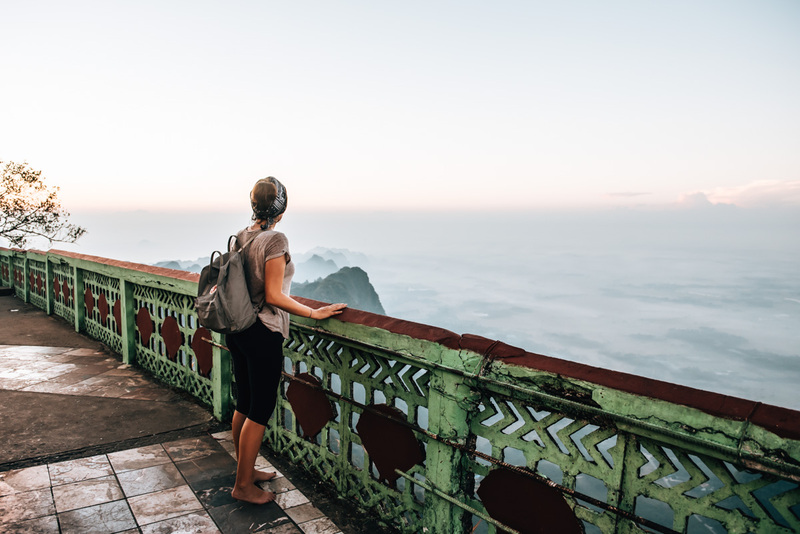 The best personal highlight of our trip in Hpa-an was no doubt found at the summit of Mount Zwegabin. 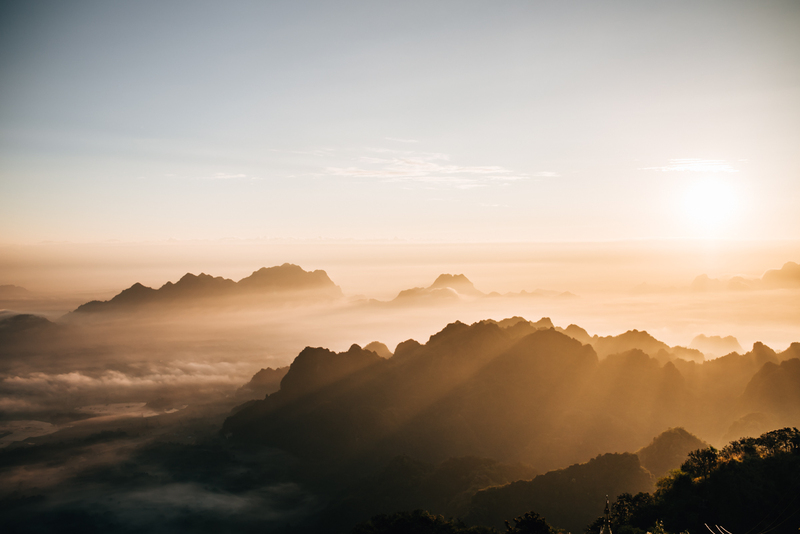 This sunrise view was one of the most beautiful moments of our entire Myanmar trip. We contemplated for hours, whether or not we should take on the strenuous challenge of ascending Mount Zwegabin. Finally, we came to an agreement – up it was! Luckily we did! And what we can say is that the view at dawn was totally worth all the effort to get there. And yes, that’s right, DAWN. Most people start their hike to the summit after sunrise, but we really wanted to watch the sunrise from up above. It’s no easy thing to do for two non-morning people like us. At 4am, the alarm goes off. By 4:40am we were on our way up. At 800 metres elevation – it was one sweaty mission, as you can probably imagine. A large part of the track consists of stairs, some are in very good condition while others have clearly been worn away over the years. In some sections you’ll find handrails for support, but every now and again you’ll have to settle for tree roots and tree trunks. Basically, the route along the stairs is very unpredictable and varies a lot, so you constantly have to watch where you step. Apart from a few, very short, mildly flat stretches, it’s uphill all the way. Even though we started in the middle of the night, our T-shirts were covered with sweat in no time. Around 6:15, we reached the monastery at the summit. Overall, it took us a little over 1.5 hrs to get to the top – but the hours felt like eternity. Despite our general level of fitness, we found the hike to be very demanding. Especially when we had to make it all the way down again, it was exhausting running back down when we hardly had any strength left in our legs. We wanted to take a few stops but eventually bit down our tongues and made our way back to the village. It goes without saying that the route will be pitch black. So dark, you can’t even see your own hand in front of your face. Therefore, make sure to bring a torch (we borrowed one from the hotel), or better yet a In dire cases, smart phone flashlights will also do. The sunrise itself varies depending on the month, so check the time in advance. Side note: Apparently we were the only ones crazy enough to hike up so early as we didn’t encounter a single soul on our way up, which was fantastic as we got the whole sunrise view to ourselves! Only on the way back down did we encounter heaps of people. The trail to the summit starts right behind the Lubini Garden, its vast area boasting more than 1000 Buddha statues. Just drive the scooter past the Buddhas until you arrive at a small carpark. Here you get off and find the start of the track, which is directly behind the park. It’s a good stretch getting there from the centre of Hpa-an: you should allow for at least 25 minutes commute with a scooter. Alternatively, you can also take a private taxi, but make sure you ask the driver to pick you up again at the end. Before you enter, there is actually a small admission fee of 4,000 kyat that you have to pay. Luckily for us, when we arrived there in the early morning, nobody was there yet to collect the funds. We only found out about the admission when we visited the Lumbini Garden the day before. Most of the visitors in Hpa-an book themselves a guided tour of the caves and temples, that way, you can tick off a lot more sights in a relatively short time. We, however, decided to visit the caves and temples with our own scooter. Although we didn’t see as many caves as you would perhaps on a tour, we did get to see much more of the beautiful surrounding nature riding on our own. So, we wouldn’t have changed a single thing! Of course we didn’t want to miss the biggest cave of Hpa-an, so we rode for about 30mins on our scooter across sandy tracks to reach the site. The dimensions of Sadan Cave are seriously impressive! However, what did bother us the most and, sadly, is often the case in Myanmar, were the flashing, glowing LED lights everywhere. When Buddha figures suddenly wear neon-coloured luminescent crowns, the line’s been crossed and it’s no longer amusing. Overall, we can’t say this cave left too good of a first impression on us, but in Myanmar, that’s a feeling we are all too well versed in, unfortunately. Nevertheless, we’re glad we visited the Sadan cave. The Sadan Cave is in fact the largest cave in Hpa-an, however, there are plenty more to be found in this area. Since we wanted to spend more time in out in the open nature, we had to limit ourselves to just seeing that one. 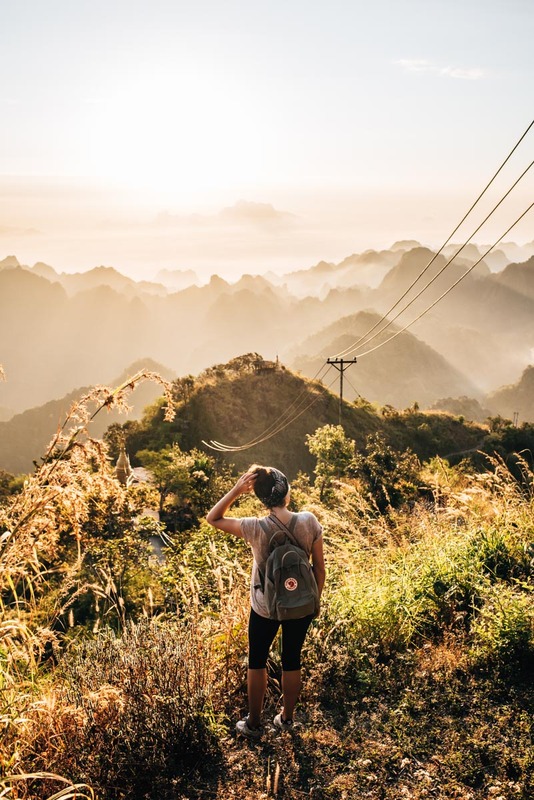 Unfortunately, we didn’t end up making it to the Bat Cave, which is known to have thousands of bats flying out of the cave into the golden open skies just before sunset – what a spectacle that must be! The Kawgon Cave is also worth seeing with its impressive rock structures. 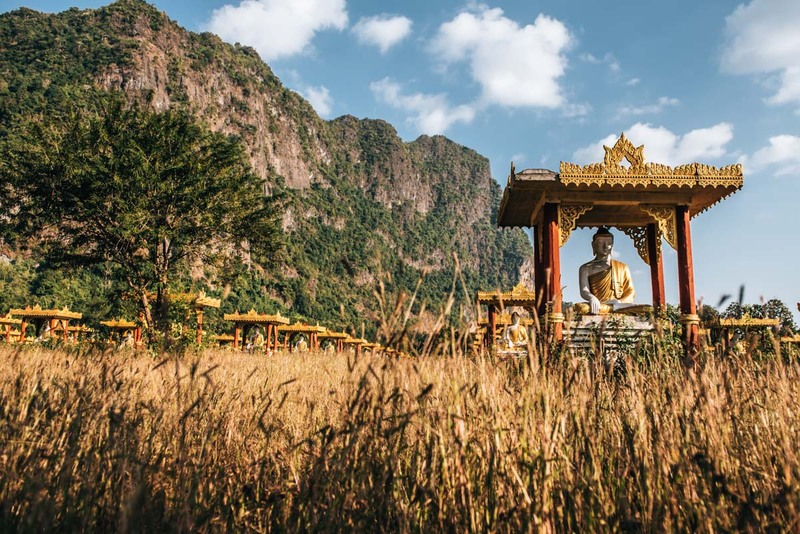 Your typical Hpa-an postcard image can be found just south of the town centre: Situated in the middle of a lake, the Kyauk Ka Lat Pagoda is a very idyllic attraction. 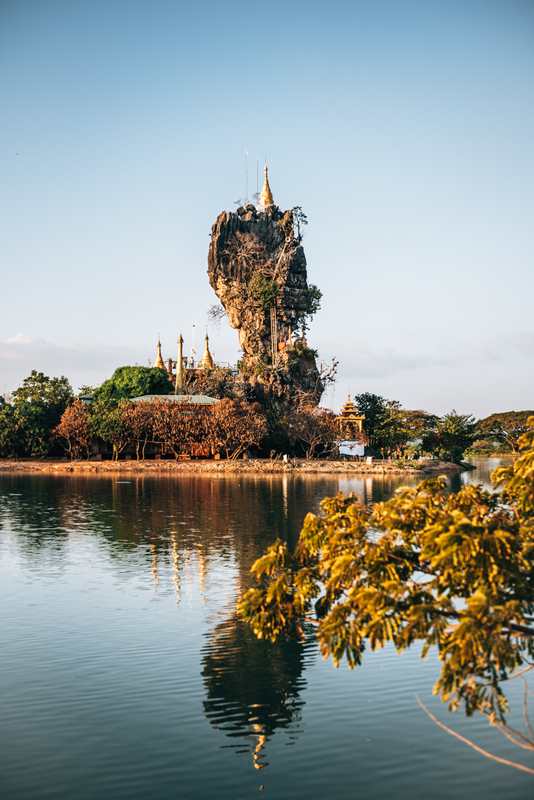 Its peculiarity: The pagoda is perched on the top of a large steep rock, a rather bizarre but very impressive sight for sure! We were there just before sunset and loved the atmosphere at this time of day! 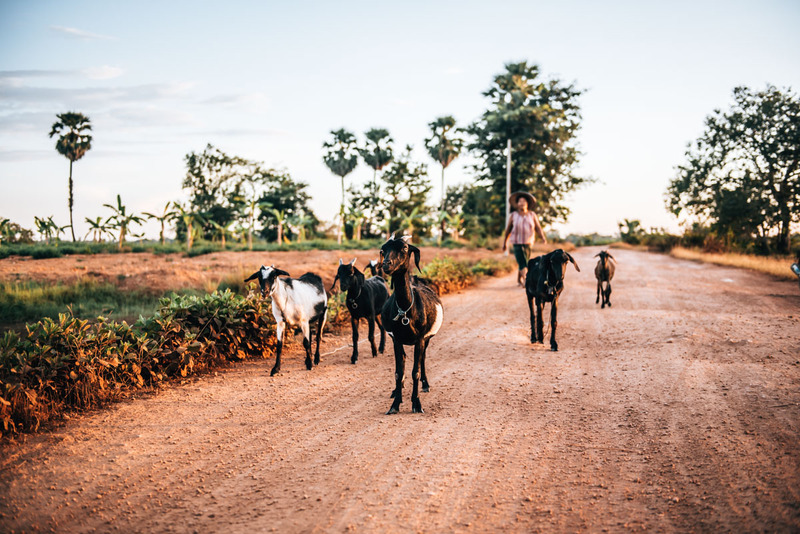 We also highly recommend that you explore the rice fields around Hpa-an by scooter (more about scooter driving in Hpa-an can be found later in this article). From the village centre, head south (along the Yone Kone road). This road also leads to the start of the ascent up Mount Zwegabin. About 500 meters before you reach Keinnara Hpa-An, turn right into a gravel road. Follow this path and soon after, you’ll find yourselves surrounded by beautiful rice fields. 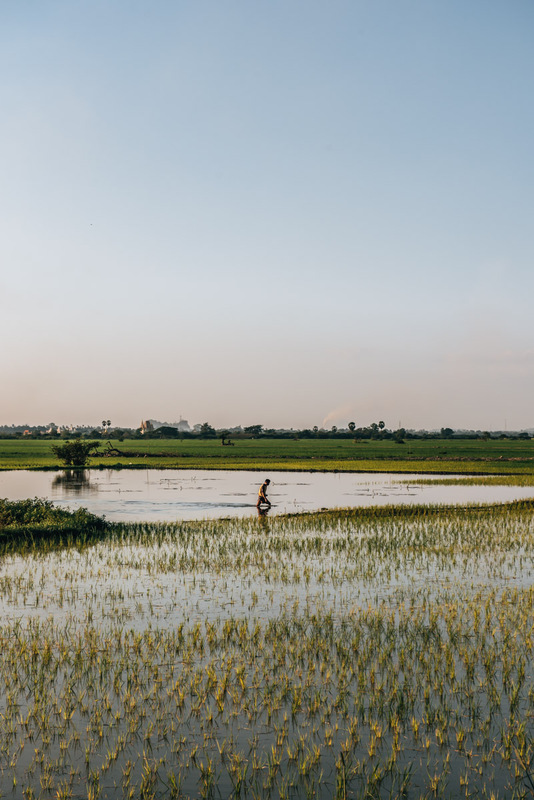 Our tip: the rice fields would pair up very well with a trip to the Kyauk Ka Lat Pagoda. If you follow the path descriptions correctly, you should end up at the Pagoda. Not an absolute must-see, but impressive in its own way is the Lumbini Garden. The word “Garden” is rather misleading, as it’s actually an unbelievably vast field studded with over a thousand Buddha statues. The visit of the Lumbini Garden can be ideally combined with the hike to Mount Zwegabin, which starts just behind it. Fees – it costs 4,000 kyat per person for admission to both. 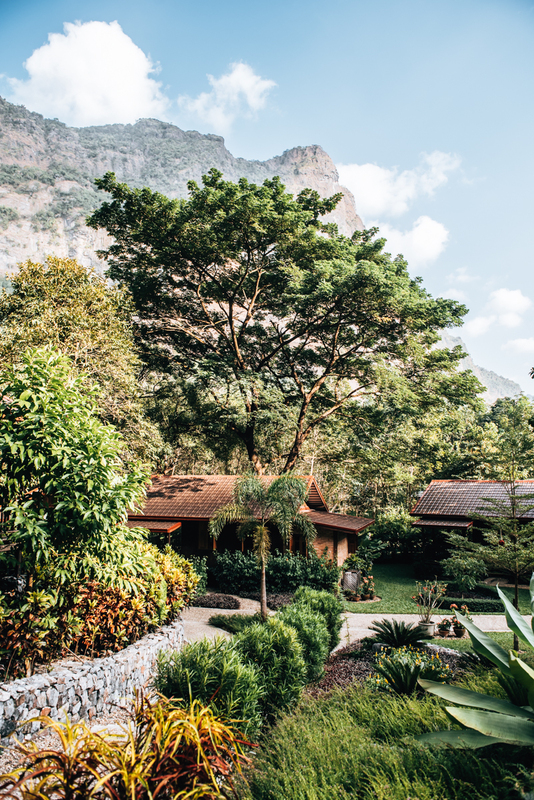 The Keinnara Hpa-An (former Hpa-an Lodge) is currently the most beautiful but also equally the most expensive accommodation in Hpa-an. Although we had set our daily budget for Myanmar much lower, we just could not resist and decided to spend two nights at the Keinnara Hpa-An. So… what can we say? We didn’t regret our decision for a single second. 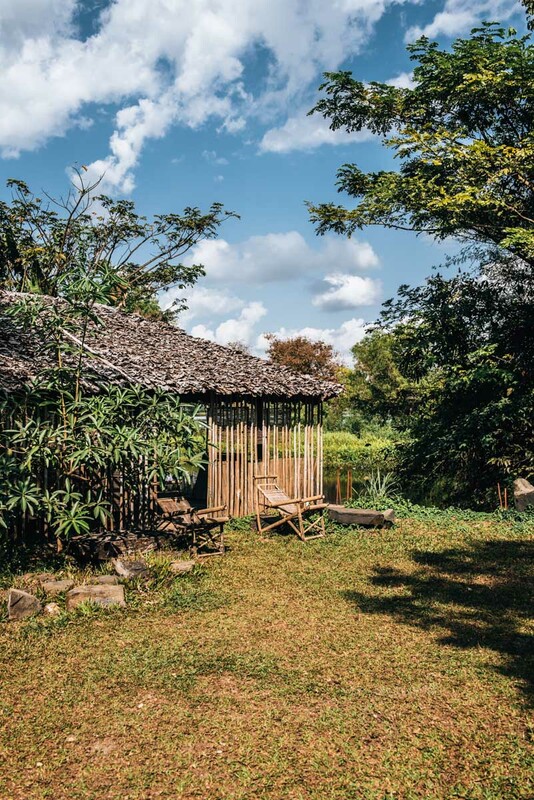 Keinnara Hpa-An is the dream accommodation. In total, there are only 19 “cottages” (ie. single bungalows), so here you can enjoy the peace and quiet, relish in the tranquility, and escape from the hustle and bustle of city life. We were really lucky with our cottage, we got the best view of the mountains from our terrace. Breakfast was served in ‘a la carte’ style and was fantastic! The fact that the Keinnara Hpa-An is not in the centre, but actually about 20 minutes away, didn’t bother us for a second because with our scooter we could get around super easy. Plus, we could get to places and the attractions much quicker from the hotel. 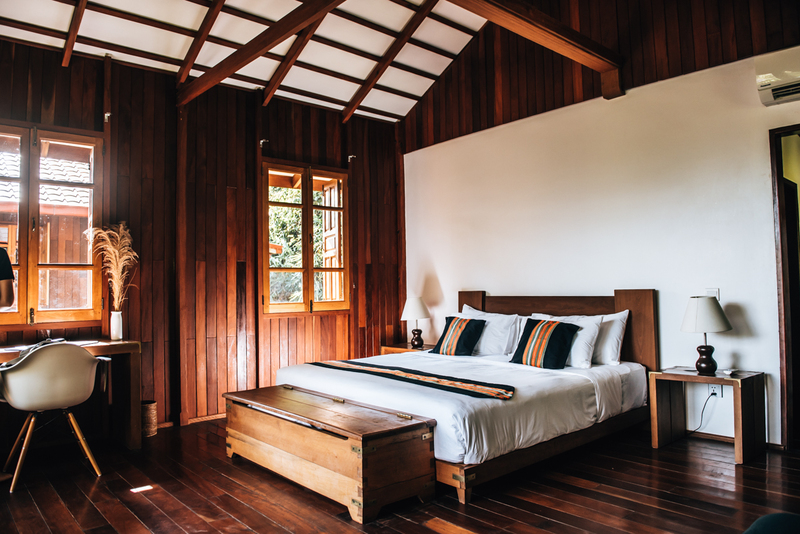 So if you want to splash out and treat yourselves to a bit of luxury in Myanmar, we can wholeheartedly recommend the Keinnara Hpa-An. The entire place made us feel very comfortable and its so beautiful. This luxury however, had a price tag of 140 euros per night for a double room. Here, they serve delicious and authentic Thai food. The selection for us vegetarians was unfortunately a bit limited, but the dishes turned out to be super yummy! Plus, the price is really cheap: for both of us, we only paid 7000 kyat, so slightly more than 4 euros, despite the fact we even enjoyed a beer. The Thai Village Restaurant is located outside the village centre on the opposite side of the river. If you’re riding a scooter, cross the bridge from the centre (Than Lwin Bridge), then turn left when you see a sign with the name of the restaurant. From the main road you’ll have to drive through some narrow streets, but don’t worry, directions are signposted! You know us: we’d never miss an opportunity to scout for good coffee. And while this is proving to be a big challenge in Myanmar, we did find it at Veranda Youth Café. 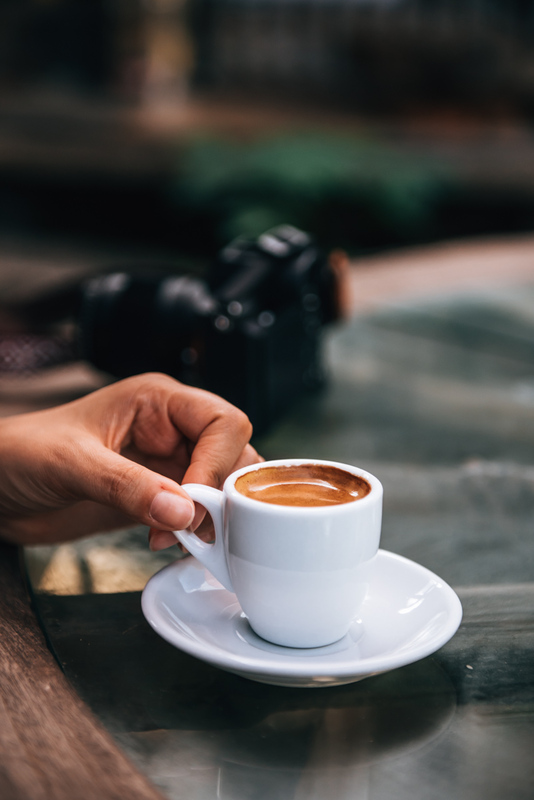 The concept behind the café is also pretty cool: it sees itself as a big community for young people in the region, where they can find a place with the Veranda Youth Community Café, that they can chill and enjoy. Unlike many other tourist destinations such as Bagan or Ngapali, tourists in Hpa-an are currently still allowed to rent regular scooters. We paid 8,000 kyat for one day. (as of December 2017). 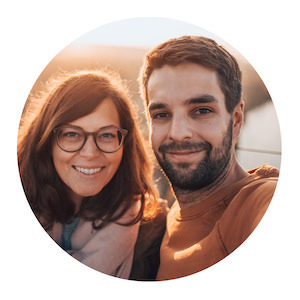 This blog article contains our personal recommendations in the form of so-called affiliate links. If you book or buy something via these links, we will get a small commission. For you, this does not change the price. Cool thing, right? Biggest thanks from both of us! 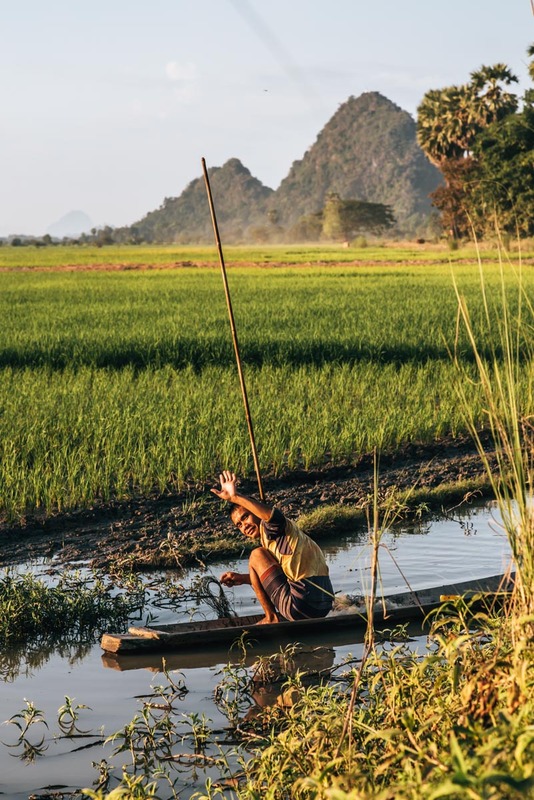 Have you been to Hpa-an in Myanmar and have you got some stories you’d like to share? Or do you intend to travel to Hpa-an soon and might have a question for us? Either way, we look forward to your comment! Ia it posible to rent a scooter to visit Saddan Caves then go climb the famous mount and still check out the bat cave during the evening? What would you suggest for a day?